What a cast! What a concept! And we haven't even gotten to the producers yet. While Temple might just turn out to be a mediocre horror thriller, it has all the potential to be one of the best horror movies released in coming years. KISS co-founder Gene Simmons is producing alongside WWE Studios with Wesley Snipes set to headline alongside WWE Superstar Seth Rollins. Wait, it gets better. Crazy lady Anne Heche is also joining this wicked ride alongside actor Dave Annable. The movie is coming from Gene Simmons' own genre specialty label Erebus. John Stockwell, who helmed the upcoming reboot Kickboxer: Vengeance, is set to direct. The movie begins shooting this week. 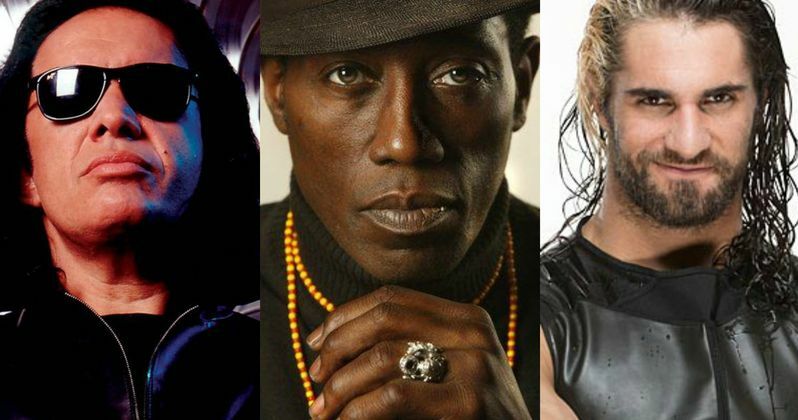 Wesley Snipes will also produce alongside WWE Studios president Michael Luisi. Matt Savelloni, who doesn't have any substantial credits to his name, wrote the script. The story follows a team of trained operatives trapped inside an isolated military compound. The base's artificial intelligence has suddenly shut itself down. Now, this team must face off against strange and horrific phenomena. About the movie, Wesley Snipes had this to say. "It's exciting to find myself in a genre I have always wanted to explore. We are looking forward to a great brand collaboration with Erebus, WWE and Gene." Temple doesn't have a set release date at this time, but should arrive sometime in 2017. WWE Studios will use its flagship promotional platform to support and promote the horror thriller when it arrives in theaters and VOD. Voltage Pictures will handle international distribution. What do you think? Did this just zoom to the top of your most wanted list for 2017?